Calcimimetics decrease parathyroid hormone (PTH) levels in uremic patients with secondary hyperparathyroidism without increasing serum calcium (Ca). The aim of this study was to evaluate the effect of calcimimetic R-568 alone or in combination with calcitriol on vascular and other soft tissue calcifications in uremic rats with secondary hyperparathyroidism. Sham-operated and 5/6 nephrectomized Wistar rats were studied. 5/6 Nephrectomized rats were treated with vehicle, calcitriol (80 ng/kg every other day), R-568 (1.5 and 3 mg/kg per d), and both calcitriol and R-568 1.5 mg/kg, as above. Rats were killed after 14 or 56 d of treatment. Blood was drawn for biochemical measurements. Aortic, heart, kidney, lung, and stomach tissue samples were processed for histopathology and measurement of tissue Ca and phosphorus content. PTH concentrations were significantly reduced by all treatments. Treatment with calcitriol induced significant vascular calcification (aortic Ca increased to 4.2 ± 1.2 mg/g at day 14 and to 11.4 ± 0.7 mg/g at day 56; P < 0.05 versus vehicle). Treatment with R-568 did not induce vascular calcification. Concurrent administration of R-568 with calcitriol reduced the aortic Ca (1.9 ± 0.2 mg/g at day 14 and 7.5 ± 1.4 mg/g at day 56) in relation to calcitriol alone. Soft tissue calcifications mirrored aortic mineralizations. Survival was significantly (P < 0.001) reduced in calcitriol-treated rats, and mortality was attenuated (P = 0.01) by concurrent treatment with R-568. In uremic rats, R-568 reduces elevated PTH levels without inducing vascular calcification, prevents calcitriol-induced vascular calcification, and decreases mortality. Vascular calcification, a widely recognized and common complication of chronic kidney disease (CKD), increases the risk for cardiovascular morbidity and mortality (1,2). Although the causes of vascular calcification in CKD remain to be elucidated, associated risk factors include age, hypertension, time on dialysis, and abnormalities in calcium (Ca) and phosphorus (P) metabolism, resulting in a raised serum Ca-P product (Ca × P) (3,4). Pathologically, two distinct patterns of vascular calcification have been identified (5,6), and it is common for both types to be present in uremic patients (7). The first, atherosclerosis, is associated with lipid-laden macrophages and intimal hyperplasia, whereas the other, medial calcification, occurs in the media of the vessel in conjunction with a phenotypic transformation of smooth muscle cells into osteoblast-like cells (7). Another hallmark of advanced CKD is secondary hyperparathyroidism (HPT), characterized by elevated parathyroid hormone (PTH) levels and disordered mineral metabolism. The elevations in Ca, P, and Ca × P that are observed in patients with secondary HPT have been associated with an increased risk for vascular calcification (2,3,8). Commonly used therapeutic interventions for secondary HPT, such as Ca-based phosphate binders and doses of active vitamin D sterols, can result in hypercalcemia and hyperphosphatemia (8–10), which are associated with the development or exacerbation of vascular calcification (3,8,11). In addition, the active vitamin D sterol calcitriol may act on specific vitamin D receptors that are constitutively expressed by vascular smooth muscle cells (VSMC) (12). Calcitriol has been shown to increase expression of several proteins that are involved in calcification (e.g., alkaline phosphatase) and to decrease expression of proteins that inhibit calcification (e.g., PTH-related peptide) (13,14). Recently, a number of compounds that can selectively modulate the Ca-sensing receptor (CaR) have been synthesized. These compounds, referred to as type II calcimimetics, bind to the CaR and increase its sensitivity to extracellular calcium, thereby suppressing PTH secretion without inducing hypercalcemia (15). Clinical trials using the calcimimetic cinacalcet HCl (Mimpara/Sensipar, Amgen, Thousand Oaks, CA) have demonstrated the ability of this class of compounds to decrease PTH, Ca × P, and serum Ca and P in dialysis patients with secondary HPT. Because calcimimetics reduce PTH levels without the induction of hypercalcemia, it is likely that patients who have advanced CKD and are treated with a calcimimetic may show less risk for vascular calcification than patients who are treated with vitamin D sterols. To explore this concept better, we undertook rodent studies using the type II calcimimetic R-568. Previous preclinical studies have demonstrated that R-568 attenuates PTH secretion (16), reduces parathyroid cell proliferation (17,18), and improves the histologic signs of abnormal bone turnover (19,20). Our study was conducted to investigate the effect of R-568 alone or in combination with calcitriol on the development of vascular and other soft tissue calcifications in a rat model of uremia-associated secondary HPT. Male Wistar rats that weighed 250 g were purchased from the Animal Breeding Facility of the University of Cordoba (Cordoba, Spain). Rats were housed on a 12-h/12-h light/dark cycle and given ad libitum access to normal diet (Ca = 0.9%, P = 0.6%). The experimental protocols were reviewed and approved by the Ethics Committee for Animal Research of the University of Cordoba, and all rats received humane care in compliance with the Principles of Laboratory Animal Care formulated by the National Society for Medical Research and the Guide for the Care and Use of Laboratory Animals prepared by the National Academy of Science. The rodent model of CKD used in these studies was induced by 5/6 nephrectomy (5/6 Nx), a two-step procedure that reduces the original functional renal mass by five sixths. In the first step, rats were anesthetized using xylazine (5 mg/kg, intraperitoneally) and ketamine (80 mg/kg, intraperitoneally), a 5- to 8-mm incision was made on the left mediolateral surface of the abdomen, and the left kidney was exposed. The left renal artery was visualized, and two of the three branches were ligated tightly, after which the kidney was inspected for infarct and returned to an anatomically neutral position within the peritoneal cavity. The abdominal wall and skin incisions were closed with suture, and the rat was placed back into its home cage. After 1 wk of recovery, the rat was reanesthetized and a 5- to 8-mm incision was made on the right mediolateral surface of the abdomen. The right kidney was exposed and unencapsulated, the renal pedicle was clamped and ligated, and the kidney was removed. The ligated pedicle was returned to a neutral anatomic position, and the abdomen and skin incisions were closed with suture materials. The rat was allowed to recover in its home cage. Sham-operated rats underwent the same procedures without renal manipulation. The experimental schedule is shown in Figure 1. After the second surgery, the diet was changed to normal Ca (0.6%) and moderately increased P (0.9%) content. The rats were randomly assigned (on the basis of the normal distribution of baseline body weights) into six experimental groups: Sham-operated (n = 20; used as a control), 5/6 Nx + vehicle (saline; n = 17), 5/6 Nx + calcitriol 80 ng/kg (Calcijex; Abbot, Madrid, Spain) intraperitoneally every other day (n = 25), 5/6 Nx + R-568 1.5 mg/kg per d subcutaneously (n = 18; Amgen), 5/6 Nx + R-568 3 mg/kg per d subcutaneously (n = 10), or 5/6 Nx + combination of calcitriol 80 ng/kg and R-568 1.5 mg/kg (n = 25) dosed as above. At day 14, 13 sham-operated rats and 10 rats from each treatment group were killed. Treatments were maintained for the remaining rats for 55 d. At day 56, all surviving rats were killed by aortic puncture and exsanguination under general anesthesia (intraperitoneal sodium thiopental) 24 h after the last dose of drug. After the rats were killed, the abdominal aorta, the heart, the lungs, the stomach, and the remnant kidney were dissected. In the 56-d experiments, some rats died before the completion of the study. Deaths were recorded to assess the difference in survival rate between treatments. In dead rats, blood samples could not be obtained; however, the aortas and organs from these rats were retrieved shortly after death and were used for assessment of calcification. Twenty-four additional rats were used to study the evolution of plasma ionized Ca along the entire day (24 h). These rats were allocated into three experimental groups: 5/6 Nx + calcitriol 80 ng/kg intraperitoneally every other day (n = 8), 5/6 Nx + R-568 1.5 mg/kg per d subcutaneously (n = 8), or 5/6 Nx + combination calcitriol and R-568 1.5 mg/kg (n = 8). The experiments were performed after the rats had been receiving the treatments for 14 d. Rats from each group were killed, using the above described protocol, sequentially along a 24-h period at 2 h (n = 2), 6 h (n = 2), 12 h (n = 2), and 24 h (n = 2). Vascular and soft tissue calcification was studied by histology and by measuring the tissue Ca and P content. Samples of the abdominal aorta, the heart, the right lung, and the remnant kidney were fixed in 10% buffered formalin and subsequently sectioned and stained for mineralization by the von Kossa method. Another portion of the aorta was demineralized in 10% formic acid, and the arterial tissue Ca and P content was measured in the supernatant according to the method described by Price et al. (21). Quantification of tissue mineral content was performed as described previously (22). Briefly, the stomach and the left lung from each rat were placed into separate 50-ml tubes. Twenty milliliters of 150 mM HCl was added to each tube. The tubes were mixed by inversion for 24 h at room temperature, and Ca and P were measured in the acid extract. Matrix Gla protein (MGP) mRNA was quantified using real-time reverse transcription–PCR (RT-PCR). A 5-mm length of aorta was placed in Trizol (Sigma, St. Louis, MO) and stored at −80°C until analysis. Aortic tissue samples were placed in nuclease-free 1.5-ml microcentrifuge tubes for total RNA extraction. The tissue was ultrasonicated for 5 min at 4°C and immersed in liquid nitrogen (−196°C) to allow for complete cell rupture. Then, 400 μl of a lysis buffer from a commercial kit for tissue total RNA extraction (Mammalian Total RNA Miniprep Kit; Sigma) was added to the samples. Total RNA was extracted using the same kit. Extracted total RNA was dissolved in nuclease-free water (Promega, Madison, WI) and quantified by spectrophotometry (NanoDrop Technology, Wilmington, DE). The MGP and β-actin genes were amplified and quantified by real-time RT-PCR (Lightcycler; Roche, Basel, Switzerland) using primers for rat MGP (sense 5′-(GC) GA GCC AAA TAA GAG CGC AAG-3′ and antisense 5′-CAT GTG AGG AAC AAG CAA CG-3′) and rat β-actin (sense 5′-TGT AAC CAA CTG GGA CGA TAT GGA G-3′ and antisense 5′-ACA ATG CCA GTG GTA CGA CCA GA-3′). Each sense strand was marked with SYBR-green fluorochrome (Quantitec SYBR-green RT-PCR Kit; Qiagen, Barcelona, Spain). Data were analyzed using Lightcycler 3.5.28 software (Roche). Blood for chemistry analyses was obtained from the abdominal aorta at the time of killing. Blood for measurements of ionized Ca levels was collected in heparinized syringes and analyzed immediately using a Ciba-Corning 634 ISE Ca2+/pH Analyzer (Ciba-Corning, Essex, England). Afterward, plasma was separated by centrifugation and stored at −80°C until assayed. PTH levels were quantified according to the vendor’s instructions using a rat PTH(1-34) immunoradiometric assay kit (Immunotopics, San Clemente, CA). Plasma creatinine, P, and total Ca were measured by spectrophotometry (Sigma Diagnostics, St. Louis, MO). Values are expressed as the mean ± SE. The difference between means for two different groups was determined by t test; the difference between means for three or more groups was assessed by ANOVA. P < 0.05 was considered significant. All rats survived for the first 14 d after nephrectomy and the change in diet. However, differences in survival were found between treatment groups from days 15 through 56. Mortality was zero in the sham and 5/6 Nx + calcimimetic groups and was only 1% in the 5/6 Nx + vehicle group. However, 80% (12 of 15) of the 5/6 Nx rats that were treated with calcitriol alone died. This value was significantly (P = 0.01) reduced to 40% (six of 15) when 5/6 Nx rats received the combination of calcitriol+calcimimetic. At day 14, mean plasma creatinine concentration in sham-operated rats was 0.53 ± 0.02 mg/dl. As expected, all 5/6 Nx rats had significantly (P < 0.05) higher creatinine levels (range 0.83 ± 0.04 to 0.89 ± 0.03 mg/dl) before any drug treatment with no significant intergroup differences. Treatment with calcitriol resulted in a significant (P < 0.05) increase in plasma creatinine concentration (1.05 ± 0.07 mg/dl) in relation to the other 5/6 Nx groups. The combination of calcitriol and R-568 did not significantly elevate creatinine levels (0.93 ± 0.05 mg/dl) when compared with R-568–or vehicle-treated 5/6 Nx rats. At day 56, a slight further increase in plasma creatinine concentration was detected in 5/6 Nx rats (1.08 ± 0.05 mg/dl; P < 0.05 versus day 14). Plasma creatinine levels were significantly higher (P < 0.05) in calcitriol-treated rats (1.17 ± 0.01 mg/dl) than in the other groups (range 0.90 to 1.08 mg/dl). Plasma levels of ionized Ca, P, and PTH at day 14 are depicted in Figure 2. Plasma ionized Ca levels were similar in 5/6 Nx and sham-operated groups (1.21 ± 0.01 versus 1.23 ± 0.01 mmol/L). Plasma ionized Ca levels in rats treated with R-568 at 1.5 (1.20 ± 0.02 mmol/L) or 3 mg/kg (1.22 ± 0.02 mmol/L) were not different from the 5/6 Nx vehicle-treated group (1.21 ± 0.01 mmol/L). However, treatment with calcitriol alone or in combination with R-568 resulted in significantly (P < 0.05) higher plasma ionized Ca levels (1.28 ± 0.02 and 1.26 ± 0.01 mmol/L, respectively) when compared with the 5/6 Nx vehicle-treated or R-568 alone-treated groups (Figure 2A). Plasma P levels (Figure 2B) were not different between the sham-operated (6.9 ± 0.7 mg/dl) and the 5/6 Nx rats treated with vehicle (6.5 ± 0.4 mg/dl) or R-568 at 1.5 (6.6 ± 0.3 mg/dl) or 3 mg/kg (6.9 ± 0.4 mg/dl). 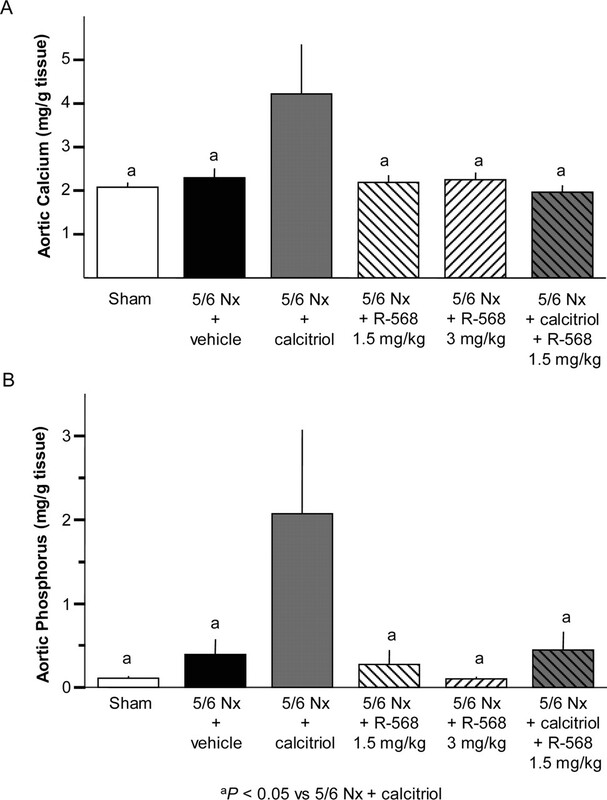 Rats that received calcitriol alone exhibited significantly (P < 0.05) elevated plasma P levels (10.2 ± 0.9 mg/dl) when compared with vehicle-treated 5/6 Nx rats. 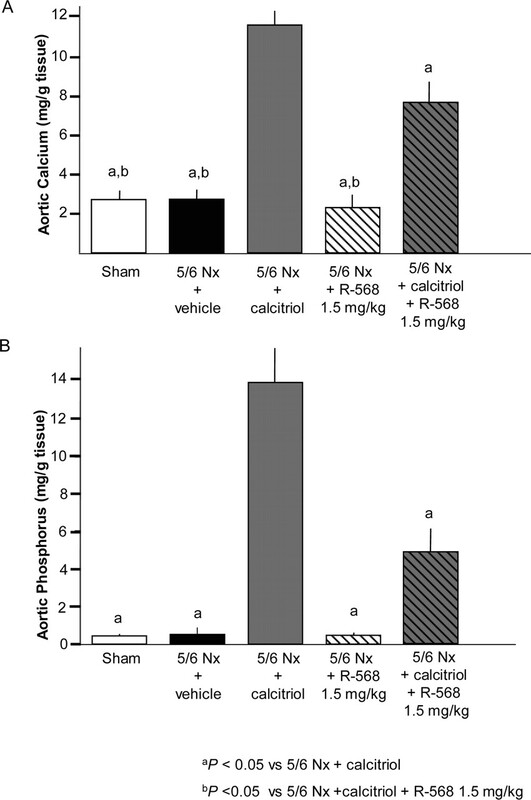 The combination of R-568 and calcitriol did tend toward decreased plasma P levels (8.7 ± 0.7 mg/dl) but was still significantly (P < 0.05) higher than vehicle-treated 5/6 Nx rats. Plasma PTH concentration was significantly (P < 0.05) increased in 5/6 Nx rats (118.7 ± 27.7 pg/ml), when compared with sham-operated rats (39.3 ± 7.9 pg/ml). All treatments used reduced plasma PTH concentrations to levels that were not significantly different from the sham-operated rats. However, the combination of calcitriol and R-568 resulted in a significantly (P < 0.05) more effective PTH suppression (13.8 ± 2.6 pg/ml) than R-568 1.5 mg/kg (73.5 ± 12.8 pg/ml) alone (Figure 2C). 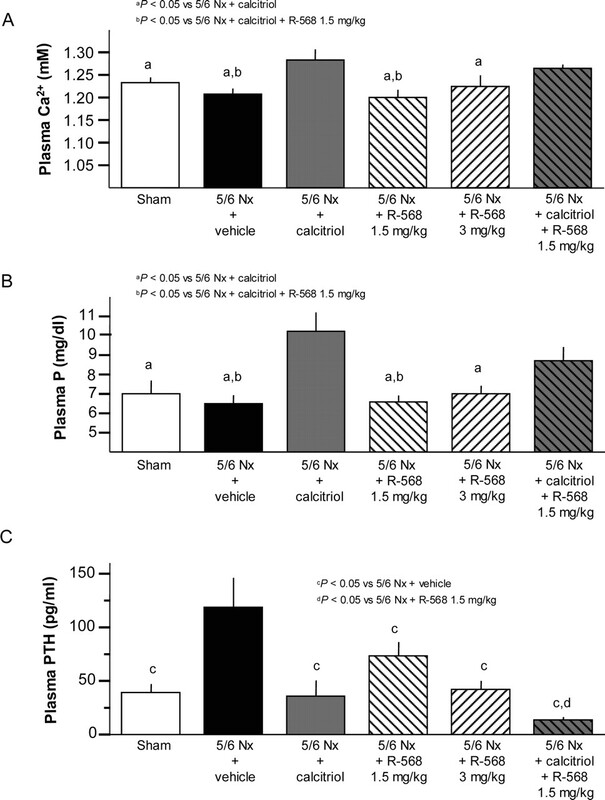 Plasma levels of ionized calcium (Ca; A), phosphorus (P; B), and parathyroid hormone (PTH; C) in sham-operated rats, or 5/6 nephrectomized (5/6 Nx) rats treated with vehicle, calcitriol (80 ng/kg on alternate days), R-568 1.5 mg/kg per d, R-568 3 mg/kg per d, or calcitriol + R-568 1.5 mg/kg as above, for 14 d.
The examination of the plasma biochemical parameters at day 56 was limited by mortality in the calcitriol-treatment groups. Plasma PTH concentrations in the 5/6 Nx group were significantly (P < 0.05) increased (338 ± 129 pg/ml) when compared with the values obtained at day 14. All treatments resulted in a significant (P < 0.05) reduction in PTH levels (range 38.3 ± 18.4 in the Nx + calcitriol + R-568 group to 47.9 ± 14.6 in the 5/6 Nx + calcitriol group). Ca and P values were similar to the values observed at day 14. Because calcitriol-treated rats were underrepresented, the differences between groups were less evident. 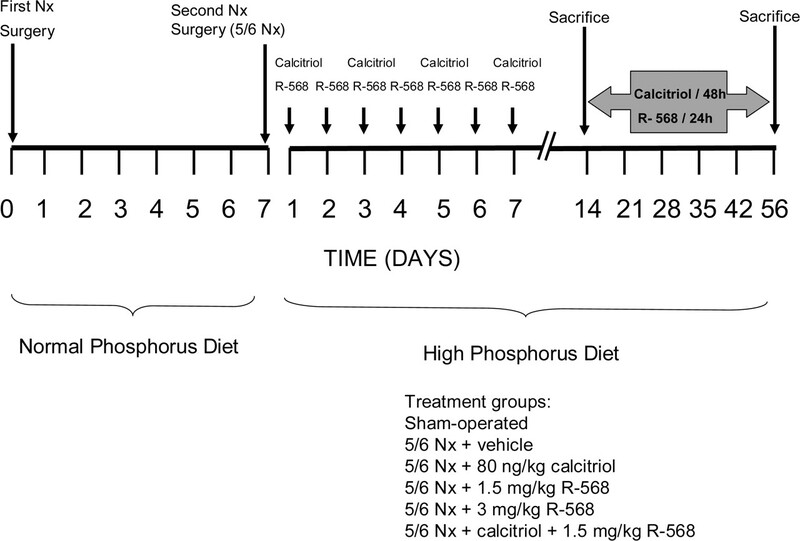 In line with the increased serum mineral levels that were observed with calcitriol administration, treatment of 5/6 Nx rats with calcitriol significantly increased aortic calcium content (4.2 ± 1.1 mg/g tissue at day 14 [P = 0.009] and 11.4 ± 0.7 mg/g tissue at day 56 [P < 0.001]) compared with vehicle-treated 5/6 Nx rats (2.3 ± 0.2 mg/g tissue at day 14 and 2.4 ± 0.1 at day 56; Figures 3A and 4A). 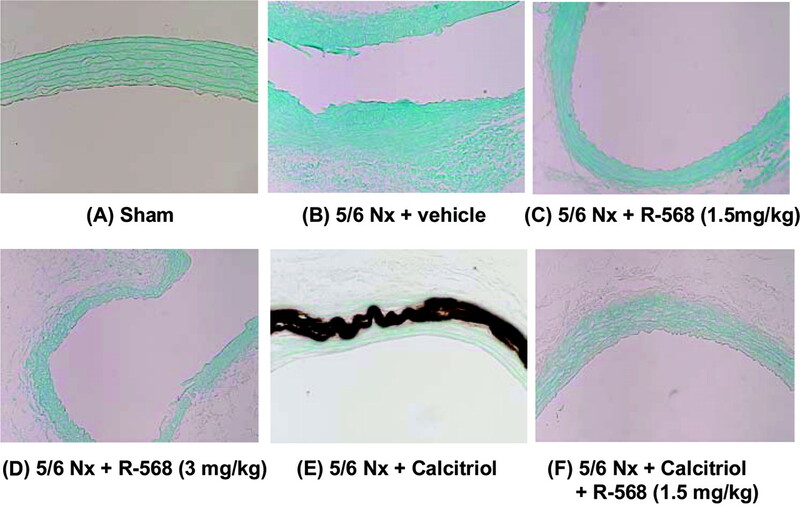 Treatment with R-568, however, resulted in similar aortic Ca content to vehicle-treated 5/6 Nx or sham-operated rats at both 14 and 56 d (Figures 3A and 4A). Surprising, given the nonsignificant effect of combination calcitriol and R-568 on serum Ca levels, the calcitriol-induced increase in aortic Ca was significantly attenuated by concurrent treatment with R-568 1.5 mg/kg both at day 14 (1.9 ± 0.2 mg/g, P = 0.002) and at day 56 (7.5 ± 1.4 mg/g, P = 0.003; Figures 3A and 4A). Ca (A) and P (B) content of the aorta in sham-operated rats or in 5/6 Nx rats treated with vehicle, calcitriol (80 ng/kg on alternate days), R-568 1.5 mg/kg per d, R-568 3 mg/kg per d, or calcitriol + R-568 1.5 mg/kg as above, for 14 d.
Ca (A) and P (B) content of the aorta in sham-operated rats or in 5/6 Nx rats treated with vehicle, calcitriol (80 ng/kg on alternate days), R-568 1.5 mg/kg per d, or calcitriol + R-568 1.5 mg/kg as above, for 56 d.
Additional analyses demonstrated that the aortic P content of sham-operated rats was not different from that in vehicle-treated 5/6 Nx rats at either 14 or 56 d (Figures 3B and 4B). Treatment of 5/6 Nx rats with calcitriol significantly raised P (2.1 ± 1 mg/g tissue at 14 d [P = 0.01] and 13.9 ± 1.8 mg/g tissue at 56 d [P < 0.001]), whereas R-568 (1.5 or 3 mg/kg) did not (Figure 3B). The calcitriol-induced increase in aortic P was significantly attenuated by concurrent treatment with R-568 1.5 mg/kg both at 14 d (P = 0.013) and at 56 d (P < 0.001; Figures 3B and 4B). In situ aortic mineralization was examined by means of the von Kossa staining method (Figure 5). Mineral deposits in the aorta were not observed in the sham-operated–, vehicle-, or R-568–treated 5/6 Nx groups (Figure 5, A through D). However, marked von Kossa staining was detected in the aortic media of 5/6 Nx rats treated with calcitriol alone (Figure 5E). The addition of R-568 1.5 mg/kg to the calcitriol-treatment regimen prevented the development of aortic calcification (Figure 5F). Von Kossa–stained sections of the aorta in sham-operated rats (A) and in 5/6 Nx rats treated with vehicle (B), R-568 1.5 mg/kg per d (C), R-568 3 mg/kg per d (D), calcitriol 80 ng/kg on alternate days (E), or calcitriol + R-568 1.5 mg/kg as above (F), for 14 d.
Calcification was also demonstrated in soft tissues by histology (heart, lung, and remnant kidney) and measurement of mineral content (lung and stomach). In rats treated with calcitriol alone, von Kossa staining was detected in muscle fibers of both ventricles and septum as well as in myocardial arteries (Figure 6A). Numerous large mineralization foci were observed in interalveolar septi, and mild calcification was also evident in large pulmonary arteries. Mineral deposition was also noted in the basement membrane of renal tubules and glomeruli of the calcitriol-treated rats (Figure 6B). No peripheral inflammatory response that was associated with calcitriol-induced calcifications was found in any tissue sample. Rats from the other groups did not show positive von Kossa staining or showed only very mild staining in heart (Figure 6C), lung, and remnant kidney (Figure 6D). Measurements of tissue Ca and P content in the stomach and in the lung are shown in Table 1. Calcitriol-treated rats (5/6 Nx + calcitriol) had a higher Ca and P content in both stomach and lung than the other groups (P < 0.05). As with the aortas, rats treated with calcitriol + calcimimetic had Ca and P values intermediate between the 5/6 Nx + calcitriol and the 5/6 Nx + R-568 groups, although the differences were not statistically significant. Von Kossa–stained sections of the heart (A and C) and the kidney (B and D) from 5/6 Nx rats treated with calcitriol (80 ng/kg on alternate days, for 56 d; A and B) and from 5/6 Nx rats treated with R-568 (1.5 mg/kg per d, for 56 d; C and D). The results obtained after monitoring plasma ionized Ca levels for 24 h in 5/6 Nx rats treated with R-568, with calcitriol, or with the combination calcitriol + R-568 are shown in Table 2. Rats treated with calcitriol showed higher plasma ionized Ca during the course of the day than rats treated with R-568. MGP mRNA expression (MGP mRNA/β-Actin mRNA) was similar in sham-operated and vehicle-treated 5/6 Nx rats (0.74 ± 0.12 versus 0.71 ± 0.09). A nonsignificant increase in MGP mRNA was detected after treatment with R-568 for 14 d (1.45 ± 0.23; P = 0.397). Calcitriol-treated rats had an increased expression of MGP mRNA levels (2.84 ± 0.90) when compared with all other groups (P < 0.05). Addition of R-568 to calcitriol treatment had no significant affect on MGP mRNA (1.84 ± 0.25) concentration (Figure 7). Matrix Gla mRNA content in the arterial wall in sham-operated rats or in 5/6 Nx rats treated with vehicle, calcitriol (80 ng/kg on alternate days), R-568 1.5 mg/kg per d, or calcitriol + R-568 1.5 mg/kg as above, for 14 d. Values are expressed as the ratio to β-actin. In the preclinical study in uremic rats with secondary HPT presented here, the calcimimetic R-568 reduced plasma PTH and mineral levels without causing aortic and soft tissue calcification and attenuated the mineralizing effect of calcitriol on vascular and extravascular tissue. On the basis of preliminary experiments, we selected a calcitriol dose that would be effective in controlling secondary HPT. Although both R-568 and calcitriol effectively reduced PTH, PTH levels tended to be lower in rats that received calcitriol than in those that were treated with R-568. In this respect, it is important to note that recent data suggest that oversuppression of PTH with elevated Ca and P levels may be as harmful in patients with ESRD as overt HPT with respect to mortality (23). The differences in efficacy and potentially the improved PTH-lowering efficacy of the calcitriol/R-568 combination may be explained, at least in part, through the differing mechanisms used by calcitriol and R-568 to reduce serum PTH. Calcitriol acts primarily at the nuclear level, decreasing the transcription of PTH mRNA, as well as through elevating serum Ca levels, whereas R-568 acts at the cell membrane by increasing the sensitivity of the CaR to extracellular calcium (15,24). In addition to PTH, serum Ca and P levels are sensitive to vitamin D treatment (9,10,25,26). The increased serum mineral levels can contribute to hypercalcemia and hyperphosphatemia, both of which have been associated with increased morbidity and mortality in patients who receive dialysis (27). In this study, treatment with calcitriol resulted in a significant elevation in serum Ca and P levels and led to the development of vascular calcification and high rate of death. The calcitriol-induced vascular calcification was consistently localized in the media of the aorta of uremic rats. This kind of calcification is independent of lipids and seems to be related to phenotypic transformation of smooth muscle cells into bone-producing cells (7). The mineralizing effect of calcitriol can be explained by the increase in the serum Ca and P observed after its administration, although other smooth muscle–based mechanisms may also play a role (28). Our results show an increase in MGP mRNA in rats that were treated with calcitriol. These results agree with previous studies in which 1,25-dihydroxyvitamin D3 treatment has been shown to induce MGP synthesis by osteosarcoma cells in vitro (29). Although MGP is thought to be an inhibitor of vascular calcification—rats that are deficient in MGP develop spontaneous medial calcification (30)—different studies have demonstrated an upregulation of MGP in calcified arteries of both nonuremic (31) and uremic patients (32). Thus, the increase of MGP in the arterial wall of calcitriol-treated rats may be interpreted as a defensive mechanism against vascular calcification. Calcification is a very complex phenomenon, and this study investigated only a limited number of factors that might be involved in the calcification axis. Thus, other factors (e.g., fetuin-A, osteoprotegerin, PTH-related peptide) may also play an important role. In the clinical setting, the occurrence of hypercalcemia and/or hyperphosphatemia or the development of elevated values for Ca × P necessitates withholding or reducing the dose of calcitriol (33). An alternative therapeutic approach would be the use of a calcimimetic. Here, when used alone, R-568 did not result in significant increases in serum Ca and P. More important, it did not result in mineral disposition in the aortic tissue or in vascular calcification. Most interesting, when it was used in combination with calcitriol, the degree of vascular calcification was attenuated from levels seen with calcitriol alone. Together, these data suggest not only that calcimimetic therapy can be used to control PTH levels in uremic patients but also that they will be able to do so without the pathologic elevations in Ca and P that are associated with the clinical use of certain vitamin D sterols. Current clinical practice, however, makes significant use of vitamin D sterols. The data presented here, as well as preliminary analyses of clinical data (34,35), suggest that a calcimimetic, either alone or in combination with reduced-dose vitamin D, could be used to attenuate the risk for vascular calcification that is induced by calcitriol administration in uremic patients. Although the mechanisms of action that are responsible for the anticalcification effect of R-568 have not yet been elucidated, they may be related to the fact that it can control PTH levels without increasing the Ca × P. The results of our experiment in which ionized Ca levels were followed for 24 h support this contention. Rats that were treated with R-568 were exposed to lower Ca levels for a period that ranged from 6 h (when R-568 was used in combination with calcitriol) to 12 h (when R-568 was used alone). In addition, some evidence suggests that calcimimetics may act directly at the cellular level on the arterial wall. The existence of the CaR on VSMC is equivocal, however. Some investigators have demonstrated its presence using a polyclonal antibody to the CaR (36), whereas other preliminary studies have failed to detect CaR in bovine and human VSMC using RNAse protection assays (37). Even though VSMC may not express CaR, they have been reported to respond to extracellular Ca (36). The response of VSMC to calcium is thought to occur through interaction of Ca with a cationic sensing mechanism similar to what has been described in osteoblasts (38). Treatment with calcitriol increased serum creatinine levels in our model, indicating that calcitriol can further deteriorate renal function in 5/6 Nx rats. The results of the histologic studies showing abundant mineral deposition in the remnant kidney of calcitriol-treated rats suggest that the calcitriol-induced deterioration in renal function could be related to nephrocalcinosis and/or vascular calcification at the kidney level. By contrast, R-568 did not seem to deteriorate renal function and prevented the calcitriol-induced increase in creatinine. In support of this, it was shown recently that the calcimimetic NPS R-467 attenuated furosemide-mediated nephrocalcinosis in young rats (39). In our study, long-term treatment of secondary HPT with calcitriol resulted in an 80% death rate, as compared with 40% mortality in rats that were treated with the combination calcitriol + R-568 and 0% mortality in rats that were treated with R-568 alone. The protective effect of R-568 may be explained by the decrease in vascular and soft tissue calcification, which may have resulted in the preservation of function in kidneys and other organs. This study shows that, when administered to uremic rats, the calcimimetic R-568 reduces PTH levels without inducing vascular calcification. In addition, R-568 can attenuate the calcitriol-induced calcifying effects on vascular tissue and decrease mortality associated with calcitriol. Thus, calcimimetics provide a means of controlling serum levels of PTH and bone-associated minerals in secondary HPT and, more important, may lower the risk for vascular calcification in these patients. The work reported here was supported by government grants BFI2001-0350, BFI2001-1901, PI20345, JA152/03, and JA106/03; Group CTS-179; Fundación Nefrológica; Fundacion Reina Sofia-CajaSur; Amgen. Y.A. is a postdoctoral fellow supported by the Ramon y Cajal Program of the Ministerio de Ciencia y Tecnologia (Spain). This study was presented in part in abstract form at the Congress of the Spanish Society of Nephrology, Tenerife, Spain, October 2004; and at the 2004 Annual Meeting of the American Society of Nephrology, St. Louis, MO, October 27 to November 1, 2004.